Liverpool have signed forward Roberto Firmino from Hoffenheim on a five-year deal for a fee of about £29m. The 23-year-old's deal is subject to a medical, which will take place after he returns from Chile, where he has been playing for Brazil in the Copa America. Firmino, who has scored 47 goals in 151 games for Hoffenheim, becomes the Reds' second most expensive player. The Anfield club made Andy Carroll their record signing when he joined them for £35m from Newcastle in 2011. They also paid Southampton £25m for Adam Lallana in 2014, and have already brought in Burnley striker Danny Ings, goalkeeper Adam Bogdan, defender Joe Gomez and midfielder James Milner this summer. The Reds have so far resisted two offers from Manchester City for England forward Raheem Sterling. 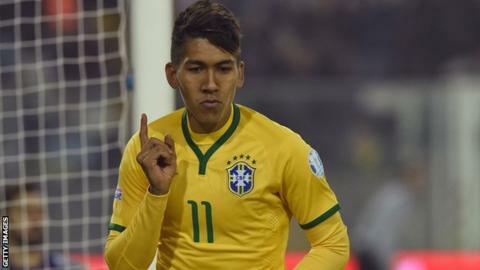 Firmino, who has spent the last four and a half seasons in the Bundesliga, was on target for Brazil in their 2-1 Copa America victory over Venezuela on Sunday. In the absence of Neymar, who has been suspended for the rest of the tournament, Firmino and Philippe Coutinho, who is already a Liverpool player, are set to start again in Saturday's quarter-final against Paraguay. "Liverpool are genuinely delighted to have completed this deal with such speed. "Brendan Rodgers wants quality over quantity this summer and Firmino has produced at the very highest level, with four goals in nine games since his call-up by Brazil in November. "He has adapted to life in Germany well, which suggests he can settle quickly on Merseyside. "Is it a gamble? Liverpool have only once paid more money for a player. But the hope this time is the signing is remembered for all the right reasons."